I'm sure many of us were watching the presidential election coverage on FOX News, CNN, MSNBC, or the traditional TV networks (ABC, NBC, CBS) last night. Well you probably noticed lots of technology being used by the news anchors and commentators. I thought I would share this news release since it is timely. Sunnyvale, Calif. - Nov. 3, 2004 - Fujitsu Computer Systems today announced its Stylistic(R) ST5020 Tablet PC was used by NBC news anchor Tom Brokaw and political analyst Tim Russert during election night coverage Nov. 2, 2004. The Fujitsu Stylistic ST5020 Tablet PC replaced Russert's famous white board used during NBC's coverage of the 2000 election. During last night's broadcast, Russert wrote updates on the Fujitsu Tablet PC and his handwriting instantaneously appeared on the television screen for viewers to follow along with election coverage. Viewers were kept apprised about which candidates won electoral votes in each state with the information made available via the Tablet PC. Featuring wireless connectivity and weighing just 3.5-pounds, the Stylistic ST5020 Tablet PC provides portability, a fast processor, up to nine hours of battery life(1) as well as a wide viewing angle. A Tablet PC is a type of notebook computer that has a liquid crystal display (LCD) screen that a user can write on using a pen called a stylus. The handwriting is digitized and can be converted to standard text through handwriting recognition, or it can remain as handwritten text. With six intuitive Application Buttons, the two newsmen were able to quickly launch and toggle between different applications during the television coverage. The Stylistic ST5020 Tablet PC is powered by an Intel(R) Pentium(R) M Processor ULV 733 operating at 1.1 GHz. The integration of this processor from Intel is designed for low power consumption, which translates into a cooler running Tablet PC with long battery life. This Fujitsu Tablet PC features the Microsoft Windows XP Tablet PC Edition 2005 operating system. 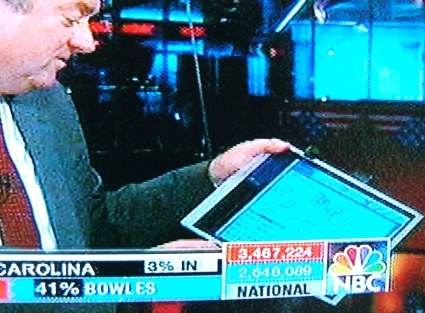 "Fujitsu is honored its Tablet PC was used as a part of NBC's election day coverage," said Richard McCormack, vice president of product and solutions marketing for mobile computing at Fujitsu Computer Systems. About Fujitsu Computer Systems Corporation Headquartered in Sunnyvale, Calif., Fujitsu Computer Systems is a wholly owned subsidiary of Fujitsu Limited (TSE:6702) committed to the design, development and delivery of advanced computer systems and managed services for the business enterprise. The company offers a complete line of high-performance mobile and desktop computers, scalable and reliable servers as well as managed and professional services. Fujitsu Computer Systems emphasizes leading-edge technology, exceptional product quality, and productivity, as well as outstanding customer service. More information on Fujitsu Computer Systems is available at http://us.fujitsu.com/computers.